Three models of WD6B/D3 live line tester are available for use between 5-12kV, 10-36kV and 50-140kV. The circuitry is housed within the tubular body. The sound LEDs’ on-off switch and test button are mounted on an oval plate facing the operator. When the unit is switched on an intermittent tone will start and the LEDs will flash in synchronisation. The entire circuitry is verified by pressing the test button. If the unit is functioning correctly the tone will become constant and the light steady. When the test button is released, the tone and LEDs will immediately revert to an intermittent signal, which operates until the unit makes contact with a live source or is switched off. The detector should be tested before an operation. It is also possible to verify the detector using a separate proving unit, type MD, which can be ordered separately. 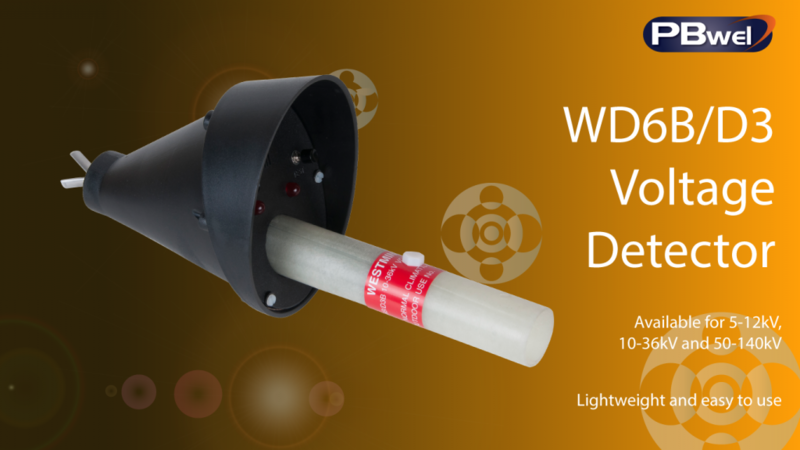 The WD6B/D3 live line tester must be mounted on an operating pole which is available separately. Various connection adaptors are also available; however the basic unit is designed to be mounted on the top section of a U.K. standard operating pole. The pole head type should be advised if only the detector is to be supplied. The number of pole sections to be used with the detector as a minimum will depend upon the voltage to be tested and the type of pole used. Periodically, it will be necessary to change the battery in the detector. The battery compartment is located in the bottom of the tubular body, below the label and can be released by removing the nylon screw.